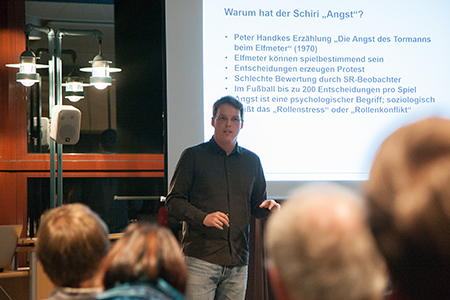 "Linie 4" is the name of a series of public lectures, organized by the doctoral researchers of the BGHS. The project started in 2009 in cooperation with the Volkshochschule Bielefeld (vhs), an educational institution in Bielefeld. The focal point of the public lecture series "Linie 4" is the dialogue between historical and sociological resaerch and a wider public. All presentations are held in German! In 1965 the United Nations have adopted the Convention on the Elimination of Racial Discrimination (CERD), which became effective under international law in 1969. Germany joined the convention in the same year. In the proceedings of the UN the adherence of the convention and so as well the anti racism policy of Germany are regularly thematised. This lecture will offer an insight in the CERD and tackle the question which forms of racist discrimination by and in Germany get reprimanded and which suggestions are brought forward by the UN. This lecture deals with the long term consequences and challenges of the remembrance of war crimes over 25 years ago in northwest Bosnia. Furthermore impressions are given, how the remembrance is propelled even outside of Bosnia. The health care system of Germany faces new challenges in the presence of increasing migration to Germany since 2015. Which risk and safety factors are decisive for the mental health of young migrants? This lecture deals which possible influencing factors on the health trajectory of infantile and adolescent migrants under a developmental-psychologically perspective. Erika Mann - A sophisticated Nomad? "Would a possible war be our own mess? Are the miseries, the falsities and crimes which happen globally our own mess?" (original: "Wäre ein Krieg, der kommen könnte, unser Privatdreck? Ist die Not, sind die Irrtümer und die Verbrechen, die auf der Welt geschehen, unser Privatdreck? "), asks Erika Mann in 1934. She was the allround talent of the Mann family: author, journalis, children's book writer, actress and political speaker. Only after the rise to power of the Nazis in Germany, she pursued politically motivated verbal counterforce. Her intellectual acts are done in exile and are influeced by being on the road. The Yazidis belong to the tribe of Kurds and are a religious minority. Stigmatized as devil worshipper and heathens they were and are persecuted, put to flight, enslaved and killed throughout the course of history, recently in August 2014. Even though in Germany lives the second largest Yazidis community globally, very little is known about them. What is unique about the Yazidis? Why are the persecuted in the 21st century? With which challenges do they have to deal with in Germany? This lecture will give answers to these questions. A total of 512 delegates from 82 countries gathered on New Year's Day of 1966 in Havana to commemorate the 7th anniversary of the Cuban Revolution and celebrate the exchange of ideas between the decolonised countries of Africa, Asia and Latin America. For this purpose, they developed strategies against enduring colonial structures and disenfranchisement of the so-called "Third World" within the international system. The presentation points out motivations of the Cuban Castro administration for the organisation of said conference and the establishment of a global strategy against racism, poverty and discrimination. In winter term 2017/18 eight doctoral researchers from the BGHS will present the third series of public lectures in cooperation with the VHS Bielefeld. China's mega-cities are full of futuristic and highly diverse consumer cultures. These consumer cultures are related to a project of national modernization by the state that tries to create a pluralized consuming middle class. Enchanted by this project of modernization, many Chinese tend to overlook how modern and diverse their country already is - and that this modernity and diversity often can be found at places believed to be "backwards". The presentation shows the diverse and advanced character of Chinese consumption and its role in the project of national modernization. The lecture is devoted to forgotten intellectual women in France in the 1920s and 1930s. As feminists, they championed their political suffrage. As journalists they fought against fascism. At the same time, as travel writers, they exposed grievances in the colonial territories. One among them is Léo Wanner. Who is (hiding) behind this name? How did Wanner place her protest into the public, and what kind of image of society/social conception did she provide and her female contemporaries? Yazidis belong to the Kurds' tribe and represent a religious minority. Stigmatized as the "infidel" and "worshippers of the evil", they were oftentimes persecuted and put to flight throughout history. The last time was in summer 2014.This presentation will deal with the Yezidis' women lives, who took refuge in Germany. How do they manage to align their old lives, their experiences during their flight with their new challenges? The rise of the sciences during the 19th century also had its impact on the legal system. Scientists were called upon for their expert testimony against murderers and other criminals. Since poison especially was used for murder in the hope to keep the crime secret, toxicological experts became the arch enemy of prisoners. To bring the perpetrators to justice, chemists had to come up with new methods of identifying poisons. Camps were central places in which the Allies imprisoned former Nazis after the end of World War II. Two of these camps were located in the Senne: in Staumühle and Stukenbrock. How did the internees experienced their time in the camps and how did they made their experiences literary? Autobiographical novels, diaries, caricatures and memoirs give an insight into the parallel world of the camps and the mindset of the sometimes high-ranking national socialists. Germany is not a typical labor market for Filipino nurses. Nevertheless, they are sought-after specialists in German health care facilities. What attracted them to come to Germany? Or has Germany hired them in the face of demographic change and labor shortage? The lecture presents the experience of nurses from the Philippines in Germany. Entgegen gängiger Vorstellungen waren Gefängnisse im Mittelalter nicht nur Folter- oder Verwahrungsorte für jene Männer und Frauen, die zum Tode verurteilt oder in Beuge- und Untersuchungshaft genommen worden waren. Der Vortrag geht der Frage nach, welche Bedeutung und Funktion die Gefängnisstrafe im Mittelalter darüber hinaus hatte. Welche Formen von Inhaftierung gab es? Welche gesellschaftlichen Konsequenzen konnte eine Inhaftierung nach sich ziehen? Wie sahen die Lebensbedingungen der Insassen aus? It is not the goal keeper who is afraid of penalty kicks for he or she can only win. The referee may hesitate, however, to award a penalty kick since these decisions are either way highly contested. Furthermore, there are many other decisions to be taken by the referee. In my presentation, I discuss in general what difference it makes for football games if its supervision is delegated to a "supposed-to-be" neutral third. I compare for this purpose supervised games with those that are being played without referee as, e.g., in the so called "Wilde Liga" in Bielefeld. A total of nine lectures took place from February to June 2016 every two weeks - Tuesday evenings in the vhs at Ravensberger Park. The term "Body" was illuminated from different perspectives: from the physical bodies, to the metaphysical bodies, to the social bodies, up to the political bodies: various aspects to acquire a reasonably adequate grasp of the things a body can do, a clutch of its various functions. The topics were discussed in sociological and historical understandings in an attempt to understand how society works. 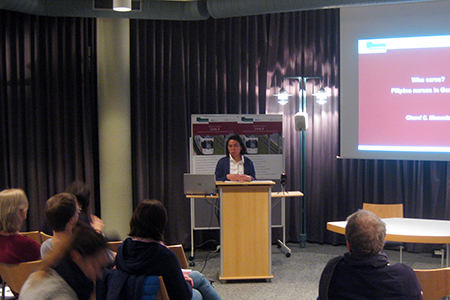 The presentations were mostly in German language and some were held in English. All lectures were followed by discussion with the public. Admission to the lectures was free. Humans Without Bodies, Mechanical Bodies Without Humans: Can History Make Sense of our Technological Future? Erwünschte/unerwünschte Migrantinnen und Migranten! Europäische Staaten und afrikanische Migrantinnen und Migranten - wer beherrscht die Körper? Participants lecture series "Linie 4"
"Schminkvideos sind auch Emanzipation", Interview with Susanne Richter in: Neue Westfälische (1 April 2016). Interview on hertz 87,9 - Campusradio für Bielefeld: Sabrina Velibeyoglu with Susanne Schulz und Christian Ulbricht (BGHS); Interview within the lecture series »Linie 4« (mp3, 17:25 min.) (Sendung: » ImPuls - das Wissenschaftsmagazin« (08.06.2016), Moderation: Sabrina Velibeyoglu). Interview on hertz 87,9 - Campusradio für Bielefeld: Interview Jan Gräber (hertz 87,9) with Britta Dostert (BGHS); Interview within the lecture series »Linie 4« (mp3, 3:44 min.) (Sendung: » ImPuls - das Wissenschaftsmagazin« (27.01.2016), Moderation: Sabrina Velibeyoglu). Interview on hertz 87,9 - Campusradio für Bielefeld: Interview Jan Gräber (hertz 87,9) with Susanne Richter (BGHS); Interview within the lecture series »Linie 4« (mp3, 3:44 min.) (Sendung: » ImPuls - das Wissenschaftsmagazin« (27.01.2016), Moderation: Sabrina Velibeyoglu).